The missile pod of an M270 227 mm multiple launch rocket system from B Battery, 1st Battalion, 92nd Field Artillery, is raised into the firing position during SPEARPOINT '84, a phase of Exercise REFORGER '84. The M270 Multiple Launch Rocket System (MLRS) is comprised of the M269 Loader Launcher Module, the M993 chassis, and the Fire Control System (FCS). The M993 Carrier is a modification of the M2/3 Bradley Fighting Vehicle System. The M269 Loader Launcher Module is manufactured and assembled at Camden, Arkansas bythe Loral Vought Systems Corporation. The LLM comprises three major components: the cage, the turret and the base. The LLM is the actual housing and firing platform for the MLRS. The LLM also houses the fire control system (FCS) components and provides hydraulic power to operate the system's azimuth and elevation mechanisms. The LLM has the capability to perform self loading and unloading of munitions launch pod containers. 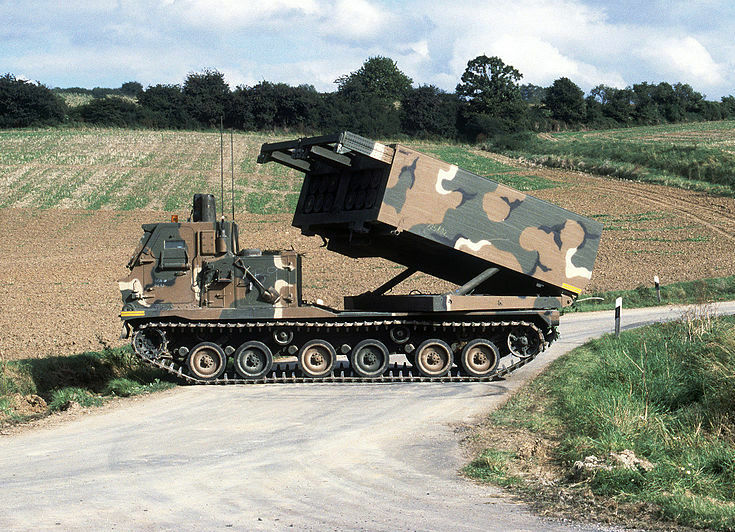 The MLRS M270 Launcher, is the standard U.S. Army platform for firing surface to surface artillery rockets and missiles. The Armored Vehicle Mounted Rocket Launcher (M270) is a full-tracked, self-propelled launcher/loader designed to launch 12 tactical rockets and re-deploy before enemy determination of launch position (shoot and scoot). The launch platform is also used to launch the Army Tactical Missile System (Army TACMS) and is capable of launching all M270 Family of Munitions (MFOM) tactical rocket/missile variants. The launcher consists of six rockets, each of which are mounted and controlled in both azimuth and elevation. It has an automated control system for aiming that automatically corrects for launcher cant and ambient temperature, a directional reference system to obtain azimuth elevation and cant angles, and a FCS which is operated from a man-rated vehicle cab. The launcher platform structure provides a "self-loading" capability.